Wellness with Penny | Empower Yourself From The Inside Out: Beauty surrounds us each moment. Have you noticed? Beauty surrounds us each moment. Have you noticed? 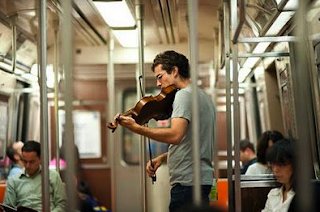 "In Washington DC, at a Metro Station, on a cold January morning in 2007, a man with a violin played six Bach pieces for about 45 minutes. During that time, approximately 2000 people went through the station, most of them on their way to work. At ten minutes, a three-year old boy stopped, but his mother tugged him along hurriedly. The kid stopped to look at the violinist again, but the mother pushed hard and the child continued to walk, turning his head the whole time. This action was repeated by several other children, but every parent - without exception - forced their children to move on quickly. How many other things are we missing as we rush through life?"